This Rewadee Pattaphong movie page contains 6 records. Kun Thong's mother is Mae Kaew (Petchara Chaowarat) but he has no father. Mae Kaew refuses to mention who the father is. Kun Thong's mother is very religious oriented (ทำบุญ). Other children such as Saen (Lak Apichat) scold him about the lack of father. Only young girl Phikun (Piyamas Monayakol) protects him. Years have passed. Phikun is the village headman’s daughter (พ่อกำนัน). Saen is the son of a local rich influential man. Kun Thong (Sorapong Chatree) is a poor farmer. Romance is happening between Phikhun and Kunthong. Phikhun believes in kindness (ทำดีได้ดี). Kunthong helps Phikhun during the sacred cloth ceremony around the village chedi (ผ้าห่มพระธาตุ). Saen is jealous about Kunthong. Petchara recommends her son not to have hope about a wedding with Phikhun as he is poor. One day Kunthong helps a young lady called Than being aggressed by ruffians. As Than has no place to go as being sold by her family, Mae Kaew shelters her in her home. At night, while Kunthong and Than are away, Mae Kaew is aggressed by Saen and his ruffians. She losts her sight. She only remembers her aggressor wears a big specific ring. She doesn't have any enemies except Seua Yoi who killed her husband twenty years ago following cards debts. Kunthong wishes to buy eye medicine to a local doctor but pricing argument degenerates into a fight with the doctor's son, who is killed by accident (Krai Kanchit). Kunthong has to flee. Saen wishes to arrest Kunthong. Meanwhile Kunthong is looking for Seua Yoi to kill him. Nowadays Seua Yoi has become a solitary monk in a cave to expiate his past mistakes. He is not the one who hurts his mother. Kunthong misses his mum but finally becomes a thief (กรรมของเขา) but a Robin Hood like as he is only stealing from dishonest people. One day Kunthong has to kill a son in front of his mother to protect himself. He has hard feelings thinking about his own mum. Than has leper (โรคติดต่อ). Kunthong decides stopping being a thief. He gets smacked by Phikhun as he doesn't care about his mum. The one taking full care is Than despite Mae Kaew is not her mother. An engagement is arranged between Phikhun and Saen (ขันหมาก). Phikhun's father forbids her to visit Mae Kaew anymore. Mae Kaew recovers sight thanks to the eye medicine given by Kunthong (แม่มองเห็นแล้ว). Kunthong is aware of the engagement. On the evening, Phikhun disappears with Kunthong. Farmers including Mae Kaew are then expropriated. Their houses are burnt. Than is left behind due to her decease. Than dies in Kunthong's arms but has time to relate the ring story. 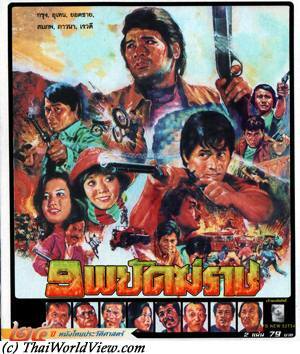 Through a suspense final, Kunthong and Phikhun surrender to the village headman but Kunthong gets shot by Saen. Only injured, Kunthong shots back Saen. The village headman's thugs shot deadly Kunthong and Phikhun is caught in the crossfire. They die in each other arms. Both Mae Kaew and the village headman feel the pain of losing their child. This movie is really about love for mothers. 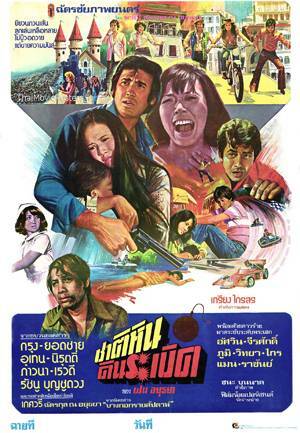 It is also a tragedy as in real life Petchara Chaowarat became blind a few months after this movie released in 1978. It was her last movie. 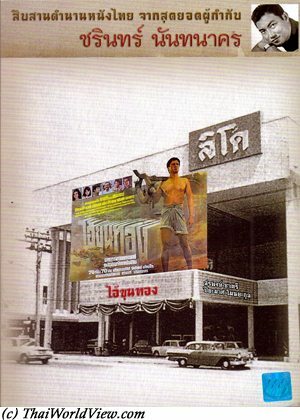 ลูกขวาน is a Thai movie released in year 1977. It lasts 1h54mn. 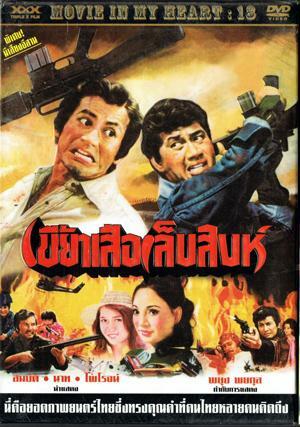 This action movie, directed by director Kom Akadej, features a great bunch of Thai actors. Sing A (Sombat Methanee) arrives too late as his father Nae Klam died already. His father was a big mafia boss (นักเลง) so smaller bosses (Chun - Dam Datsakorn, Kam - Choomporn Theppitak, Pon - Sahat Piempongsan, Krong - Kanchit Kwanpracha) want to become the leader instead. The movie features fighting between those smaller bosses in order to become the big boss. Back from overseas, Sing A is welcomed by KoLit (Kecha Plianvithee) and by his mother (Ratanaporn Intarakamhaeng). Krai Kanchit challenges Sing A but as he is defeated, he finally joins Sing A's team. Ruffians are using axes (ขวาน) for fighting so giving the movie name, i.e. ลูกขวาน, "axe child". Many groups want to get rid of Sing A. Prachom (Lak Apichat) gives a hand to Sing A aggressed by motorbikes on the beach. Kam (Choomporn Theppitak), married to Metta Roongrat, is one of the small leader wanting to kill Sing A. Nop (Kamthorn Suwanpiyasiri) and Sai (Prachuap Ruekyamdee) are close friends with Sing A. Sing A finally sympathizes with Nolee (Aranya Namwong), daughter of Nop. Phi Pon (Sahat Piempongsan) and his team start hostilities and take over a mine. Mek (Chana Sriubon) and Wan are having a love affair. Tan (Manop Aussawathep) orders to kill Sing A. KoLit and Mek defeat Pipop Pupinyo and his guys trying to enter in their ranch. Krong is shot and injured by another gang. Tan refuses to work with Phi Pon (ขายหน้า). Chat Mongkolchai and his ruffians attack Mek's house but get defeated by KoLit and Mek following a long boat race. Wedding is happening between Mek and Wan. Chun is looking for troubles during the wedding but gets punched by Sing A. Tan is burnt in his car by Phi Pon's team and becomes blind. As a revenge, Phi Pon gets killed by Kanchit. Tan relearns to shoot using his ears instead of eyes. Pinyo and his ruffians kill Sing A's mother but get axed by KoLit and Mek. Kam is arrested by the police. Aranya has a cancer but Sing A still wishes to marry her. Tan takes his revenge over those who caused the fire making him blind. All mafia leaders are now out of the game except Chun. A feast is organized but Chun's ruffians (Somsak Chaisongkram) are bringing a mess. Honor needs to be washed with blood (เลือดต้องล้างกับเลือด). Chun's house is stormed and Chun himself is killed but remaining people including Sing A get caught by police. 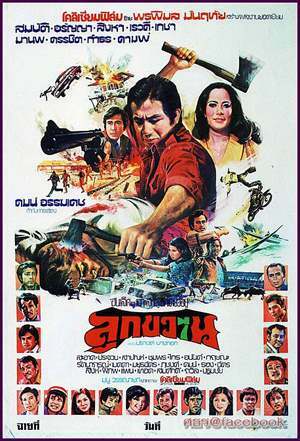 This Kom Akadej's movie is a non stop action movie featuring around twenty key actors / actresses from decade 1970s.